Hundreds of staff at Salford City Council will lose up to £2,100 a year under a proposed pay review - but bosses will have their pay frozen. Unison has called the move - which is linked to the council pledging to give staff the living wage - "appalling". More than 1,000 lower paid staff will get a pay rise to £7.45 an hour but 629 will see their salary reduced. 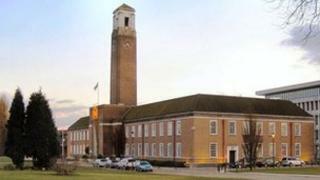 Salford city mayor Ian Stewart said pay cuts were "regretful" but the managers' pay freeze was "effectively a pay cut". The authority said the pay review has been "forced" by equal pay legislation and was not connected to Salford's budget-making process. It is something of a coup for Mayor Ian Stewart to declare Salford as the first council in Greater Manchester to offer the Living Wage to its lowest paid workers. The £7.45 an hour is even higher than the Manchester minimum wage of £7.15 and well above the national legal limit of £6.19 an hour. But it comes with a heavy heart because 629 staff will have their pay cut. It is the second phase of restructuring which began in 2009 due to equal pay legislation. The unions say it is unreasonable that the 81 highest paid staff will not see a pay cut, with a three year freeze proposed for them. Ian Stewart says he has tackled the issue with his trade union principals saying the cut will be deferred for a year and he hopes to bring down the number of staff losing out. A national pay settlement in April may help those losing out. But he accepts that's little comfort to those households facing a cut in their income. Mr Stewart said almost half of the council's workers would not be affected by the pay review. However, more than 600 staff earning over £21,000 - 11% of the workforce - will lose out if plan goes ahead. Pay cuts will come into force in April 2014 while pay rises would be given this April. Mr Stewart said: "Regrettably, we have had to cut the pay of some staff as part of a new pay structure which must conform with equal pay legislation. "But we are softening the blow for 12 months to ease any pain." He said a "conscious decision" had been made to help those at the bottom. "We will be able to help our very lowest paid staff out of poverty by giving them a significant pay increase," he said. Steven North, Salford branch manager of Unison, said many members were "very angry" at the news. "It's robbing poor Peter to pay even poorer Paul," he said. 2,984 of staff (51%) will not be affected by the pay review. "I know there are some positive aspects to the pay changes but it is very naughty to expect staff to lose money after a three year pay freeze. "Everything is going up such as gas and petrol and people are struggling already. "Times are really tough and some of our members are having to choose between food and heating so this is the last thing they need." He said the pay freeze for the top 30 highest paid managers was "effectively a pay cut". Salford City Council will become the first authority in Manchester to implement the living wage if plans are approved.